Morning friends! Happy Friday! I've unpacked all my sewing stuff and have been busily stitching away. I'm working on a sew-along, preparing my blocks and getting my photographs. The gloomy overcast weather along with the time of the year makes pictures a challenge, my house turns into a dungeon. But really even at the best of times photos challenge me. There are so many great photographers in our sewing community ! Between blocks yesterday, I decided to make a cute apple. 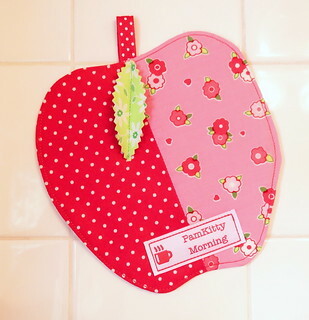 Nanette had seen Sharon Holland's cute apple pattern and I had to make it. Of course I forgot I had some cute faux leather for the stem and instead used ribbon. Dang. Now I need to make another. The little leather cord really makes it. Also I didn't have any green felt that I liked for the leaf, so I fused two pieces of green together and cut out the leaf shape with my pinking shears. I have used that technique before, I really like it. This seemed to be the perfect time to get my Dutch Label Company labels out and stitch one on. The little coffee cup was perfect as I imagine using this with a cup of coffee or tea. It would make an adorable gift, right? You could tuck this in a cellophane bag with the paper tags to close it. Super cute. You could throw in a couple of caramels like a caramel apple! Nanette included caramels and homemade dried apples with her pumpkins and it was an adorable fall gift. SEW adorable....just like you !!!!! Love this project and your gorgeous ideas! How pretty your labels look!